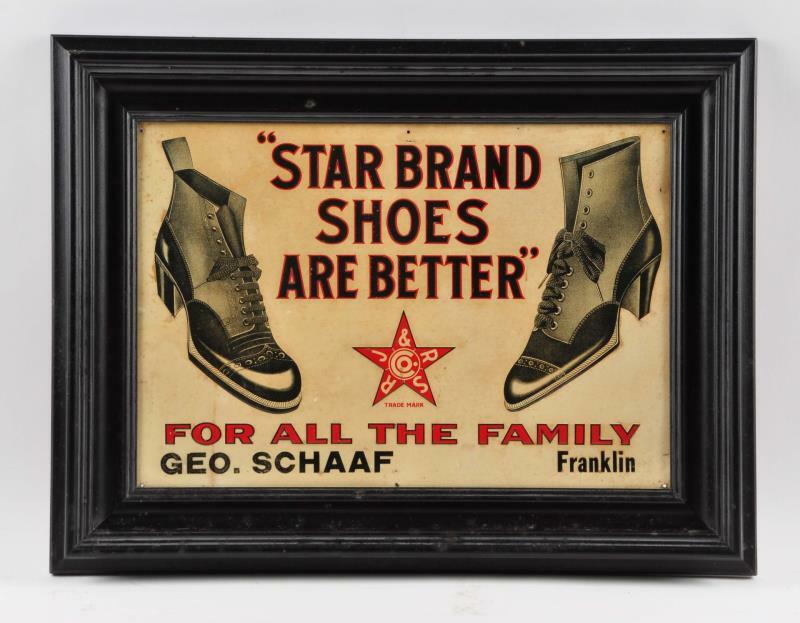 Featured here is an awesome tin sign featuring an early pair of woman’s shoes from the Star Brand Shoe label. This brand was sold by the Roberts Johnson Rand Shoe Company in St. Louis, MO. 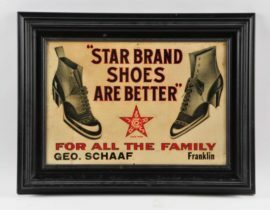 The Star Brand of shoes was prolific in their usage of small town advertising general stores to help sell their shoe brands. Collectors today can find many different styles of these tin signs advertising the companies shoes and their various styles in both men’s and woman’s wear. The advertising for this particular signs indicates the Star Brand was for “All of the Family”. The Star Brand Shoe brand was the number one selling shoe for most of the early 20th century, and remained available to consumers well into the 1960’s. While many Star Brand Shoe signs do not have the particular store on the sign, there are multiple variations of these shoes which include the specific store where the shoes where available for purchase. This particular sign designates the George Schaaf Store in Franklin, which upon a quick google search will tell you the store was in Franklin, IL. Franklin is a very small town just outside Springfield, Illinois. A STUNNING TOSETTI BREWERY STEIN – CHICAGO, ILLINOIS!BEACH-NUT TOBACCO WAS A HOUSEHOLD NAME!